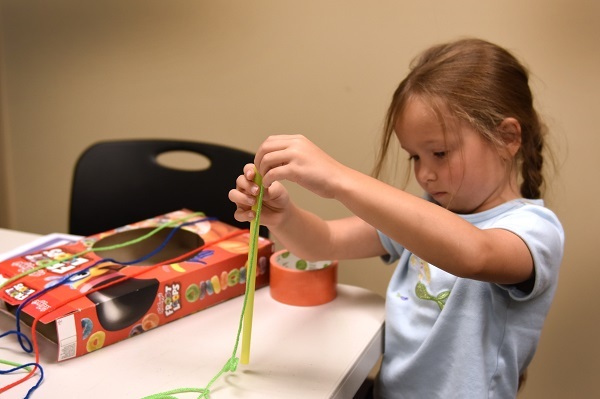 Makerspace activities help develop both critical and creative thinking skills and promote active learning by providing a hands-on space for learners of all ages to create, invent and explore various technologies. Makerspaces and youth-driven learning through experimentation can help kids gain confidence and make friends as they discover new interests, develop talents and even potentially find a future career. Makerspaces are designed to be a collaborative environment that encourages participants to share expertise, solve problems and learn new skills. Makerspaces in Georgia’s public libraries have a variety of equipment and offer programs covering topics such as laser cutting, computer programming and 3D printing. In some libraries, you can make music, create videos, make Lego towers, paint, knit, make buttons, tinker with robots and code websites. Contact your local library to see what’s available. Take a look at the map to the right to see where makerspaces are located around the state. Some locations offer makerspace services, programs and/or equipment. Contact your library for more information. 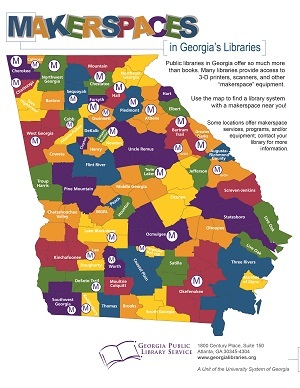 One-third of the public library systems in Georgia have makerspaces or offer hands-on makerspace activities. The list below is not an exhaustive list of every makerspace in Georgia’s libraries. Check with your local library to see what they have available. Sequoyah Regional Library System (Mobile Makerspace) Multiple locations have equipment.